Mayor Chris Beutler at the Murdock Trail dedication. This past winter has been one for the record books. Fortunately one major trail project was completed just in the nick of time—the Murdock Trail rebuild. Formerly only a limestone trail that was not cleared of snow in the winter, it was redone as a side-by-side trail—a limestone trail (which runners like) with a paved trail (that can be plowed in the winter). 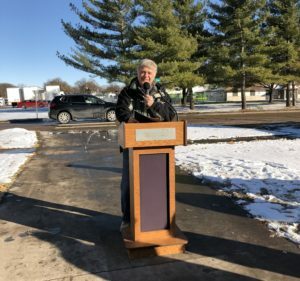 On November 18, 2018, a dedication ceremony was held with Mayor Chris Beutler presiding and remarks by representatives of GPTN and the Lincoln Track Club. Glen Moss and Joeth Zucco represented LTC, which had supported the project. A blanket of snow had fallen the night before (a harbinger of things to come), but city crews had cleared the new paved portion so that the participants would walk, run, or bike over to Ballard Park for refreshments. Given the weather we had this winter, had this project not been finished the Murdock Trail—for all intents and purposes­—would have been impassable from mid-November until mid-March! The Williamsburg Trail channel will be upgraded if the bond issue passes. In the general city election on May 7 (not the April primary), voters will be asked to approve a bond issue for stormwater drainage and flood management. What does this have to do with trails? Quite a bit, actually. Many of our trail projects are simply by-products of flood-control construction. The massive Antelope Valley Project was a flood-control project undertaken with the U.S. Army Corps of Engineers. Its completion has already saved significant flood damage on more than one occasion. 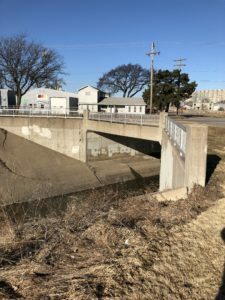 The project also removed much of the corridor east of downtown and the UNL city campus from the designated floodplain allowing for the major development of this area. For runners and bikers, however, the best feature was the new trail that stretches from Lincoln High to Innovation Campus (the old state fairgrounds). But the trail was just an add-on to the project. It has already been incorporated into the last few miles of the Lincoln Marathon. If the new bond issue passes Lincoln runners will notice several benefits. Williamsburg–SouthPointe Trails. Runners who regularly use the Williamsburg Trail from Pine Lake to Old Cheney and the side trail over to SouthPointe know that this trail has had major drainage problems since it was installed by the developer. Frequent flooding and erosion have threatened the integrity of the trail. If the bond passes this drainage system will be upgraded, the banks stabilized, and the trail rebuilt in places. This is one of the most popular trails in Lincoln and needs an upgrade. Dead Man’s Run at 33rd and Baldwin. A new, wider underpass and bridge will accommodate the Dietrich Trail. No more waiting for the traffic light. Deadman’s Run Project. 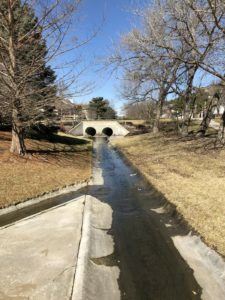 An even bigger project will take place on the north side with the city working with the Army Corp of Engineers to improve and stabilize the Deadman’s Run drainage basin. The project will remove about five hundred homes and businesses from the hundred-year floodplain. But for runners the big change will be the new bridge at 33rd Street near Huntington. The widening of the channel will leave space for a box culvert under the bridge to accommodate the Dietrich bike path. No more waiting for the light on 33rd, and there will an easier link to the trail around UNL’s East Campus. The proposed bridge to extend the Rock Island Trail at Densmore Park over the active railway lines into Wilderness Park and loop down to the Jamaica North Trail is making progress. The early design plans were sent to the railroad for approval. Some redesign was done when steel prices increased sharply following the imposition of 60 percent tariffs on steel. The new design will reduce the length of the steel bridge. Work should begin by late summer 2019. For two years I have warned about an impending closure of the Rock Island Trail under the Penny Bridges on Sheridan for replacement of defective concrete and improvement of the drainage. Each start date proved to be a false warning. This often-delayed project seems destined to start this spring after the ground dries sufficiently. In any case it will not begin before the Tabitha Run, scheduled for March 30. The underpass at 84th and Old Cheney has gone out to bid. Now all we need is some warm and sunny weather to dry everything out and allow construction on these many projects to begin. Join the Great Plains Trails Network and support Lincoln’s amazing trails system!